"Alarm! The French are coming!" In that moment, everything changed. We thought back... the heavy bombardment during the day, it had been in preparation for a raid, a "Handstreich". We recognised the messenger as one of our machine gunners who had been outside the shelter. He pushed his way through to the battalion commander and gave his report. He reported that the enemy, in full company strength, had pushed his way through the gap and was now busy rolling up our position from the rear and from the flank. He would reach the poudriere at any moment. Our spirits dropped right way. Without waiting for orders we grabbed up the recently discarded ammunition clips and filled our pouches. Unteroffizier Baumann and Hierholzer primed hand grenades and distributed them. Orders were given "Close the doors and get ready to defend the position!". Vizefeldwebel Dreitzel rushed to the left door and managed to slam and bolt it. As he did this hand grenades landed outside the door, exploding and sending a splinter into his leg. Then the enemy was silent. We wondered... were they already at the door? Inside the Poudriere we were cut off from the outside. The situation got tenser and tenser in the "Rat trap". Still, we were still optimistic; the 11th Regt would soon arrive to save the day. All lights were extinguished except for a couple of candles in the cross tunnel. Long moments passed without any signs of life from outside. Midnight arrived, and still no sign of the 11th. There was also no sign of anyone from the Stretcher bearer company that was supposed to arrive. Suddenly we head rifle fire in front of the doors, at first single shots, then bursts of machinegun fire, as if two foes were searching for each other with salvoes of bullets. We sighed with relief; it seemed as if the relief was out there. We thought it prudent to signal our position to the 11th Infantry. Unteroffizier Baumann crept a number of times up to the door to fire out a white flare. Each time the response was a flurry of hand grenades which exploded just outside the door. This was proof that the enemy was just outside the door and that we were trapped. We fired salvo after salvo through the slits in the door in an effort to keep the enemy at bay and to signal our resolution to the French. Suddenly a German voice from outside asked us to open the door to let a man in. At first we could not believe our ears. It seemed impossible that someone could make his way through all this fire and reach the door alive. At first we thought it must be a French trick but his call had caused to the French to throw more grenades and increase their rifle fire so our doubts were soon erased. Baumann rushed forward to let the man in. It was a lone survivor from the stretcher bearer company which had been completely wiped out in the enemy barrage (Sperrfeuer). He had no idea where the 11th Infantry was, but it seemed sure that they had suffered the same fate. This information took away the last of our confidence. Desperately we fired distress flares. A few men thought they heard German voices and Uffz. Baumann called out, but the only answer was heavy salvoes of fire against the doors. We could only hope that the Regt Commander in Douaumont knew of our situation and would try and rescue us. We no longer believed in any help from the 11th Infantry. The enemy began to try and creep towards the doors but we were alert and kept up our fire. Hauptmann Wilke now wanted to send a last message to Douaumont and looked for volunteers. The mission called for courage, bravery and an acceptance of a very good chance of death. Hptm. Wilke promised an award of the Bravery Medal to those who undertook the task. Uffz. Baumann and Gefreiter Zimmermann stepped forward, although they, like all others, did not believe anyone could make it back alive. Baumann made the first effort, creeping on his stomach to the door and inching it open. Right away the French opened up and bullets and grenade splinters rattled against the door. As it was now obvious that it was impossible to get out of the door, all further attempts were abandoned. Unteroffizier Baumann would receive the Golden Bravery Medal later for all his efforts during the attack on Souville and the fighting around the Poudriere. Now it was a question of defending the Poudriere with all resources. We lay in the tunnels, rifles at our shoulders, peering into the dark and listening for sounds from outside. As soon as we heard movement we opened fire. For a long while the enemy seemed uncertain of what to do. Through the slits and bullet holes in the door an eerie light could be seen. Every now and them a flare would go up, casting a ghostly flickering light over us as we lay there. For a while the enemy tried to break us by firing bursts of machine gun fire into the tunnels, most of the shots going too high. They then tried an attack which broke up in our rifle fire. Unfortunately we had no machineguns in here. As there was no cover we called back for things to be passed forward to give us some form of protection. There was nothing to be found until someone had the idea of using the food supplies. Boxes of biscuits, sacks of tinned meat, coffee and sugar were all silently passed forward. Above: One of the doors to the Poudriere showing extensive battle damage. 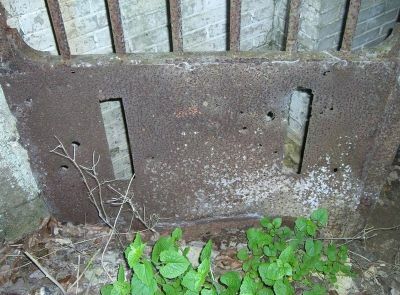 It seems to show the traces of bullets fired from the inside and outside of the tunnel. Midnight passed and still our situation remained desperate. We still hoped that Douaumont would find a way to rescue us. The Battalion staff discussed all possible outcomes. Plans were made then discarded. There was even talk of fighting our way out. If we grouped together all the men trapped in the Poudriere we had enough to make a powerful enough fighting group, one that would have been able to hold its own on the outside. The problem lay in getting the men outside, as it was we would be shot down one by one as we exited. We were forced to leave ourselves in the hands of fate and hope for rescue from the outside, determined to hold on until it came. 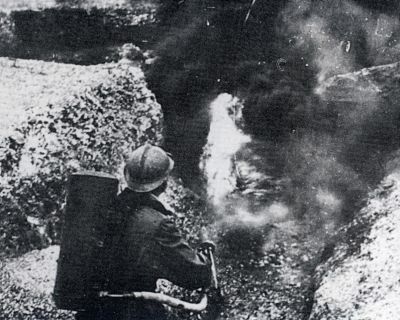 Some men mentioned the horrible possibility that the French would smoke us out with flamethrowers. Hour after hour passed and through the slits in the door we saw the suns first rays. The hope of a rescue faded. Then the first act of the catastrophe played out. A bright light appeared in the left tunnel. Calls immediately came "Light out!" as it was automatically assumed that some foolish man had lit a lamp. But the light did not go out, in fact it got brighter and soon there was fire in the left tunnel. Thick clouds of smoke filled the tunnel and Casements. We right away surmised that a flare had been shot into the tunnel and that it had set a pile of rags/Uniforms alight. It was bright enough to allow the enemy to see into the tunnel. The chaos created by the fire was right away used to the advantage of the French. While our men did all they could to extinguish the fire a jet of fire from a flamethrower roared down the tunnel spreading death and destruction. Now there was no way for the men to save themselves. Anyone caught in the jet of flame was lost. A terrible heat and smoke resulted. The men panicked and pushed their way into the cross tunnel, trying to get away from the flames. There was chaos as the men shouted out, there was no way to restore order and no voice could be heard above the shouts. The badly wounded on the floor screamed as no one took any notice and stumbled over them as they lay there. It was later established that most of the 60 wounded died terrible deaths in the last minutes of the fight. The bursts of flame in the left tunnel continued. The heat was terrible. "Gas Masks on! Gas masks on!" the call went up, but most of the men no longer had gas masks. "We will all be blown up!" came calls, and this was indeed a possibility (the flames were reaching the Stacks of French artillery shells). Nerves were stretched past breaking point, everyone pushed their way into the right tunnel where a little bit of fresh air came through the entrance. As more men crowded in men were forced out of the exit where they were right away shot down. Only when those who followed threw away their rifles and called and made gestures that they were surrendering did the shooting stop. The French were standing and kneeling, the barrels of their rifles pointing at the entrance, they let us approach. To our astonishment we saw the troops were coloured. "Les mains en l'air" they shouted roughly. Suddenly we were surrounded by the brown mass. Each of us had 3 or 4 of them knocking our weapons out of our hands, ripping off our helmets and tearing off our equipment. A few men were still coming out of the tunnel; one of the last was Gefreiter Wirnharter, who had been the last man to leave the left tunnel. Of Uzzf. Rupprecht and the rest of the men in the left tunnel, there would be no more news. With this final action the fate of the Poudriere and the small group of men in it was sealed. 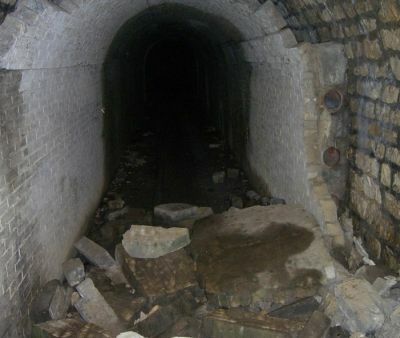 Left: The entrance tunnel to the Poudriere in which Dreitzel was wounded. We were split into two groups surrounded by dark skinned colonial troops keen on looting. Threatening and sinister the two dark entrances into the Poudriere faced us. Black smoke still came out of the mouths. No more of our troops came out. The French soldiers dared not enter; the danger of an explosion was too great. Any wounded who could not make their way out would suffocate. Leutnant von Seefried, the Bataillons-Adjutant and Hauptmann Wilke were not amongst the prisoners. No one knew where they were. As dramatic scenes were taking place outside the tunnels a last dramatic act was taking place inside the room which housed the battalion staff. Leutnant von Seefried decided to end his life with honour and shoot himself. We were only to find out later that his attempt had failed, instead of killing himself he had seriously wounded himself, the shot blinding him. He would later be captured by the French. Hauptmann Wilke was killed trying to break through enemy lines to reach our own. Stretcher bearer Maierhofer was killed after being captured. After he refused to hand over his watch, one of the beasts stabbed him to death, in spite of his red-cross armband. Robbed and mishandled the men were eventually sent to the "Kronprinzen-Straflager" for the rest of the war. Hours went by, days went by, the company waited to see if any men would be returning, but in vain. The harsh reality was beginning to set in. The 5th Company no longer existed. With the exception of the staff, and a few of the lightly wounded who had made it back, there was no one left. 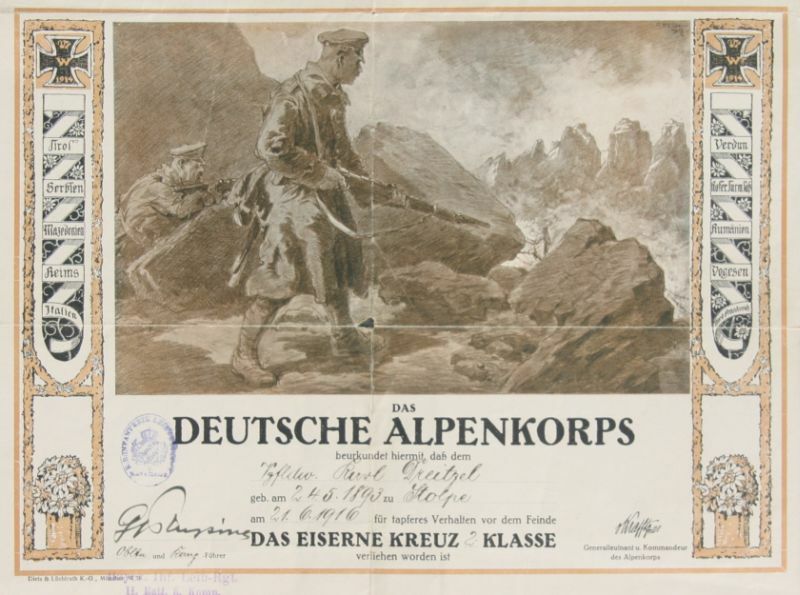 Above: the Iron Cross 2nd Class award document for Karl Dreitzel. On the 22nd of July Oberstleutnant Epp inspected the pityful remains of the company. For the men who had fought well in the preceding actions medals were presented. Quite a few were called and did not answer, their names carried away in the wind. These men lay somewhere near Douaumont, on the railway embankment, at Fleury or on the slopes in front of Souville. No officers were left, one was at the recruit depot, all the others were dead, sick or wounded. 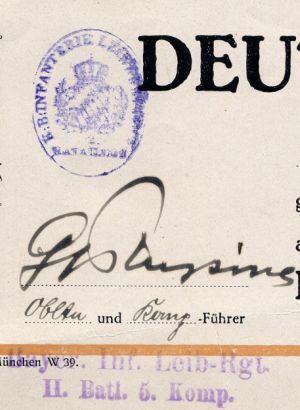 Left: The document was signed by Oberleutnant Graf Preysing who commanded the Company in mid 1918, by which time Dreitzel had been in captivity for almost 2 years. The 11th Bavarian Infantry Regiment which relieved the Leiber were part of the 6th Bavarian Infantry Division. They had been withdrawn from St Mihiel between the 13th and 16th of July and began to enter the line at Fleury on the 17th to 18th of July. By the 26th of July the Regiment signalled to its replacement depot that it immediately needed 500 replacements. Near the Poudriere the 2nd Zouaves assemble to prepare for the attack, this time supported by artillery. Exchange of hand Grenades near 2nd Zouaves-317 Inf positions. At 00:30 Some Germans exited their shell holes at the Poudriere, intentions unclear, rifle fire sends them back. The action of Battalion Thomas (5e Btn, 2e Zouaves) against the Poudriere must continue, North to South, supported by artillery and all other heavy weapons and machine guns foreseen for the attack, scheduled for 22:00 on the 19th. The 2e Zouaves carried out a brilliant attack inspite of an energetic German defence. It cleaned the valley up to the train line and pushed forward 50m to the east of the poudriere, connecting in the North West with the 3e Tirailleures and had visual contact with the 100e R.I to the South East. In the action 7 officers and 170 men were captured. French documents were recuperated in the Poudriere. German elements to the North East of the Poudriere who were gathering for a counter attack were dispersed by artillery. It is worth mentioning that the 2nd Zouaves were in fact European, attached to them were Grenadiers of one of the divisions Tirailleur Regiments. German soldiers had a fear and hatred of the French colonial troops.